My current musical obsession is Sting’s latest album ‘The Last Ship’, a musical inspired by his childhood experiences and the shipbuilding industry in the north of the UK. The music and lyrics are beautiful, folksy and are a moving and melancholy delight. I am particularly struck by a song in which Sting suggests that we keep our souls in a cage. That is, before they are set free from this mortal coil and sent to the ‘Island of Souls’ for eternity. He talks about his father’s soul, living in the same cage as the carrier pigeons that he lovingly tended to. My understanding is that his fathers soul resides in the place it feels whole, happy and rounded. Which gets me to thinking, where would my soul cage be? Probably somewhere in our kitchen. Perhaps squashed between the pages of one of the many loved recipe books or nestled in a well used mixing bowls? Is it tucked away in the motor of the KitchenAid or possibly lounging in the base of my cast iron casserole dish? I do know that one of the places I feel most content and most, well, myself, is the kitchen. This is how I show my sons, husband, family and friends; my love and appreciation. Through baking and cooking food that nourishes them, warms them, cheers them up, heals them and sometimes even challenges them. The inspiration came from a giant eggplant that needed to be eaten and a Hairy Bikers episode in Kyoto, Japan. The Hairy Bikers (like Sting and The Yak), herald from the north of England. Their passionate love of food and delightful turn of phrase is an absolute joy. 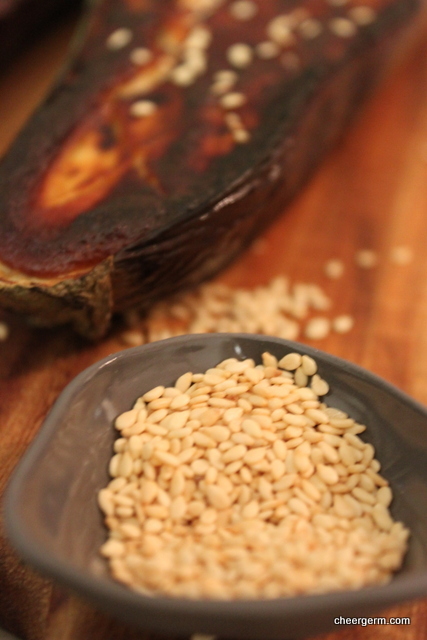 The silken eggplant combined with the umami miso paste is a revelation. Teeny miso angels rose up and played little eggplant trumpets whilst we ate…really, they did. Combined with crunchy bites of tofu, we were replete and content. As the Hairy Bikers, Sting, Northern English shipwrights or The Yak might say, this was a right cracking feed. 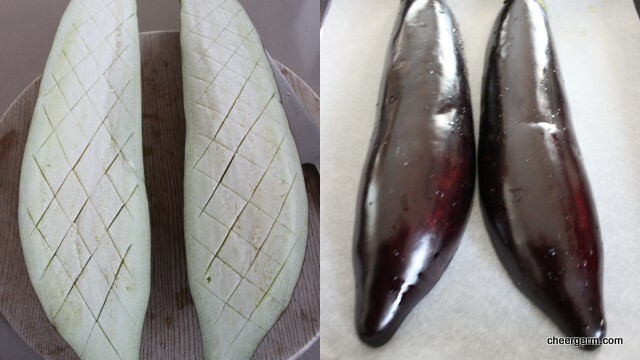 Slice the eggplant in half lengthways and score with a criss cross pattern, this helps retain the sauce. Place on a baking tray lined with baking paper, scored side down and bake in oven for 20 to 25 minutes until tender. Remove and set aside. 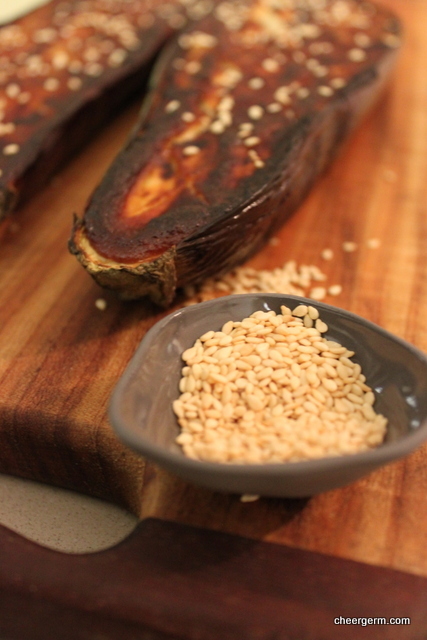 Whilst the eggplant is baking, place all the remaining ingredients (except the sesame seeds) in a saucepan and stir over a low heat until they are combined. Brush sauce over the cooked eggplant and grill for 3-5 minutes until dark golden brown and bubbling. 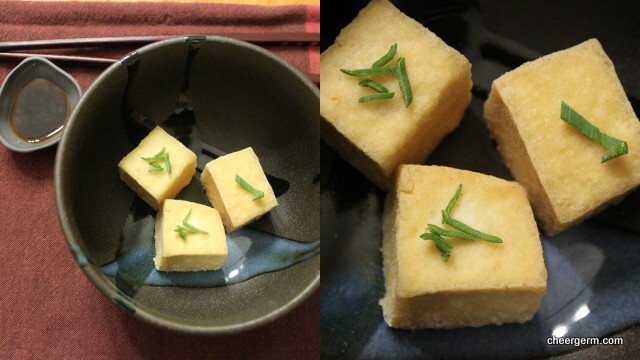 Wrap the tofu in paper towel and drain by placing a dish upon it to get rid of excess moisture. Put the dashi, soy sauce and mirin in a saucepan, bring to the boil then take off the heat and set aside. 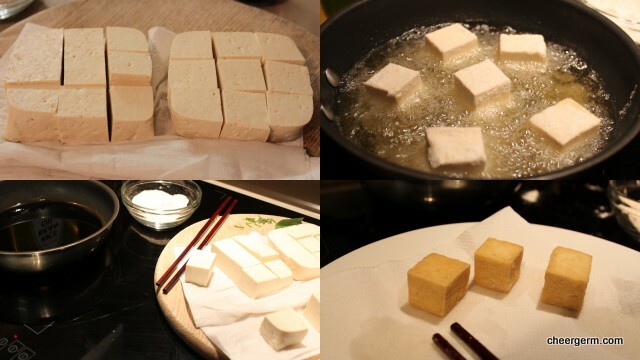 Discard the paper towel, slice the tofu in half lengthways and cut each piece into 9 pieces. Heat 1 cm of oil in a frypan or saucepan. 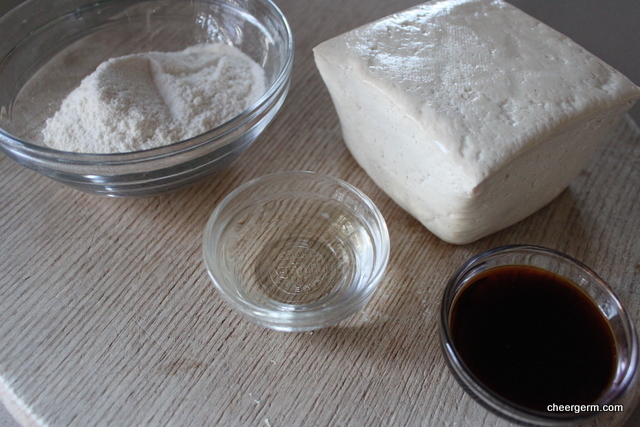 Coat the tofu in brown rice flour and fry on each side until they are light golden brown. 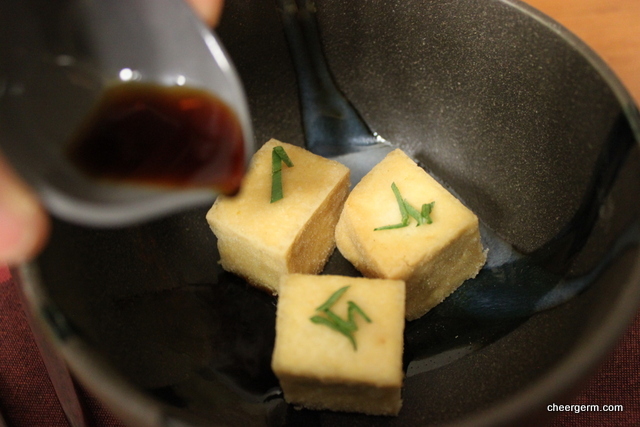 Serve the tofu with the dashi sauce poured over and garnish with the spring onion. Both recipes are based on past experiments and the recipes from websites listed after the photos. This entry was posted in Gluten free main courses, Vegetarian and tagged cheergerm, Cooking, eggplant, food, gluten free, grilled glazed eggplant, nasu denkagu, recipes, Sting, The Last Ship, tofu, tofu agedashi, vegan, Vegetarian. Bookmark the permalink. Thanks Mrs LRS! Japanese food is the bomb, I agree. It’s a bit tricky for The Yak to eat out at Japanese these days. We used to go a gorgeous country style restaurant in Neutral Bay back in the days before kids. They did this eggplant dish and an amazing salmon and egg dish to die for. 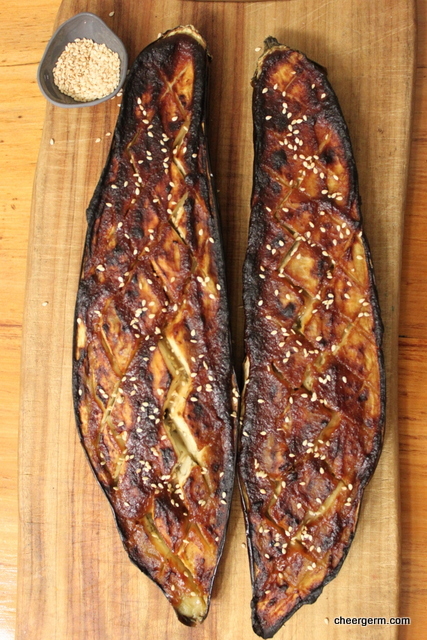 Mmmm…..
Gorgeous recipe and I agree that that eggplant looks amazing. I loved this post, especially the thought of you nestling in amongst your KitchenAid motor, keeping it running smoothly for your family during the period of your caging. It shouldn’t be a moving image and yet somehow it is! Thanks Ms IK. Such a delicious dinner that one. 🙂 The song itself is quite moving so maybe I was channelling it when writing the post? The idea of a soul cage and where each individual persons would be, really captivates me. From all I’ve read about you Cheergerm, I can’t imagine a person would spend time looking anywhere else for you than in the kitchen. There are dozens of times where I’ve actually wished your body–souless or soulful was in MY kitchen. You can bet your bottom dollar I’ll be sending care packages chalk full of gluten free goodies. I must combat the Freshman Fifteen pudge that comes as a result of overdosing on carbs. And Sour Patch Kids does not count as a food group. So much in this one post! I am fond of Sting, having seen The Police back in their pre-famous days. They were playing at Disneyworld in Florida! Also, I like Sting’s literary sensibility 🙂 The concept of the soul cage ought to be frightening, but instead it is comforting and beautiful. This dish looks truly scrumptious and makes me hungry for miso. A very satisfying way to get one’s umami fix without meat! I agree that cooking is way to show love. One of the best ways, in fact. Thank LM! Cool that you saw him back in the prefamous days, in Disneyworld nonetheless! How very ‘Un Sting like!’ I got to see the Police once, just before they disbanded. I have been a fan of his for many a year now. It was delicious and yes, great for ya’ll vegetarians to get an umami fix from. Is your beloved vegetarian? As I recall, the Police emerged into view on a small circular stage that rose up from beneath. Sting’s voice was very rough around the edges (they sang “Roxane” and “Message in a Bottle” which were their main hits at that point) and one of the other band members continuously jumped up and down, as though he was on amphetamines. Still I found them charming, especially Sting. This would have been in the very early 80s. It makes me laugh to think that a band called “Dr. Hook” was a much bigger draw at that time. Their stage was three times as big, and the crowd about ten times as big. Yes, the Long-Suffering Husband and I decided to go veg around the time we got married, almost 25 years ago! We are lucky to have similar dietary needs and preferences. I have a friend who is veg and celiac, while her husband is a standard carnivore. It works OK. He gets meat when they go to restaurants, and they both cook. Dr Hook….there is a blast from the past! Great memories there LM! Handy to be on the same page, I used to be vegetarian but no longer. I do love and generally eat vegetarian food but the big wide world of ‘other food that isn’t vegetarian’ lures me back. I am probably a reluctant carnivore…and I do think that the world of vegetarian food is wide and vast as well. It was difficult at first to give up meat (fish was not a problem for me as I never liked it anyway). It does close off a lot of options for someone who loves food and cooking and wine. But it’s been so long now that I don’t really miss it. The other thing is that it’s great for keeping us out of fast food places. I think this is how we all food bloggers share our love with the ones we give our food (: it’s a lovely story. Why thanks M. I think you are right and it is a pretty darned good way of showing love too! Eggplant is a fabulous wee vegetable hey? Such a versatile vessel for flavour. Thanks for the lovely comment and for the follow! Oooh! I think we’ve got all those ingredients! It’s a delicious curry. 🙂 For some reason WordPress ‘unfollowed’ me from your blog, it’s got a mind of it’s own sometimes! I get that in the app. Sometimes I touch the link but get unfollow instead. I am cooking this eggplant for dinner as I speak and the smell of the marinade is literally, honestly making my mouth water! Hurry up oven! Oh yeah! Hope it tasted as good as it smelt! We gobbled ours up the other night.